Thus begins Francine Prose's new book, Reading like a Writer. So if Prose is cynical about the value of writing workshops, how are writers expected to learn their craft? Prose believes that the best way to learn to write well is to read extensively, especially the good stuff. Ah yes, that's what everyone tells you, isn't it? But how far is the advice heeded by most wannabe writers? She praises Prose's Reading Like a Writer, and recommends it both for aspiring writers and for readers who’d like to increase their sensitivity to the elements of the writer’s craft. Prose's book sounds like a very useful guide and I Amazon "one-clicked" it as soon as I'd read the review. Read more on the Harper Collins website. I read to improve my writing. One of the reasons why I read so slow is because sometimes when I come across a sentence I really like or admire, I reread it 4 or 5 times, trying to "internalise" it, hoping that this good piece of writing will somehow influence my own writing. I agree with Prose when she says we should savour books, rather than racing through them. Which is why when you said you'd wondered "what can I teach her? ", the answer was so clear in my head. With those two factors, hopefully, the seeds of love of language and gift of storytelling can be sown. Sharon, I 'studied' short story writing by reading Poe, Dahl and Archer as well as the literary short stories. Katherine Mansfield is one fine short story author, as is Fitzgerald. I also 'studied' prose from Margaret Atwood. And cliffhanger writing from Dan Brown. 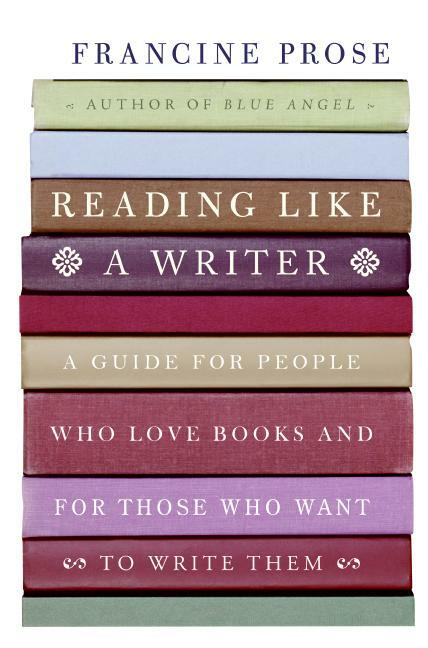 ted - and the good thing is, we needn't tell ourselves off for being slow readers! yes, i also enjoy rereading passages that give me pleasure and i'm constantly thinking about the technical aspects. spot - hope you are growing in both aspects. keep writing 'cos you have some really great stuff going on inside your head and we need it down on paper. btw at long last the book with your group's writings is ready to be sent out. now just to go to the post office! lynette - good models. i have a soft spot for archer's short stories. (love the guy for being his own best fiction!). dahl is really dark and nasty but brilliantly twisty. sinister poe was a great favourite of mine when i was a teenager. mansfield is one of the masters. atwood ... one of my favourites. brown ... how he creates cliffhangers is interesting - as soon as a scene reaches a climax - CUT! just don't emulate his lousy prose or cardboard characters. and don't nick someone else's story! Oh no -- now I want this book!! Aieeee!!! hi irene - nice to see you back blogging. was just enjoying reading some of your blog posts. Thanks, Sharon! I'm blogging most of the time, actually - I have a number of blogs. I'm trying to pay more attention to my writing blog, but most of the time I just update my main blog and my Xanga blog. Those have the usual stuff: stories of my life and what I'm thinking about. If it is true that writers need the daily discipline of writing something, no matter what, then blogging is my form of discipline!